Firstly I want to apologise for the lack of photos in my posts as of late. I have been taking some nice photos here in Merzouga, but the problem is I forgot to bring my SD card reader with me and the laptop I am using does not have one built in. Therefore I will have to update my posts with the photos when I get back to Zurich, unless I can find someone who I can borrow a card reader from. Anyway, now to the main point. I wanted to spend longer in the sun today so I decided that a walk would be more appropriate than a run. The temperature according to the weather report is 27C, and it is nice and sunny with no clouds in sight. Perfect for a spot of heat acclimatisation. I headed off into the dunes for just over 1 hour, then turned round and headed back. I took a couple of stops en route to get some good photos, but on the whole I was medium to fast walking the whole way. When I had to climb a slope that was very steep I ran up it, as I have found this to be an easier way of getting to the top than walking up. If you can work up enough forward momentum you tend to slip back less with each step. The total time for my dune hike was 2 hours and in this time I covered 7.62km. 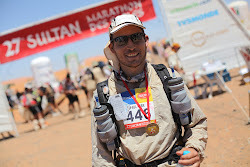 Allowing for the fact that in the MDS I would not be stopping to take photos, and I reckon I could expect to cover 4km/h walking in the dunes (although I have no intention of walking in them if at all possible). As you might have expected by now (it is kind of a daily routine at the moment), at 5pm I am off to the sauna to continue my heat acclimatisation. I may even just lie down the whole time I am in the sauna today, since I am happy to have got 2 hours of bright sunshine and warm temperatures whilst I was hiking. Runners high or primed and ready?